How can any group attain unity? I’m currently reading a fascinating book about the lives and love story of Founding Father, Alexander and Eliza Hamilton. My Dear Hamilton traces the life of Alexander Hamilton, senior aide to General George Washington and later Secretary of the Treasury under President Washington from the perspective of his wife, Elizabeth. In addition to his many contributions to the early years of the United States, Hamilton worked with future president James Madison to co-author The Federalist Papers, a series of 84 essays that interpret and promote the new Constitution. According to “My Dear Hamilton,” the men had different opinions and different ways of expressing those opinions. Yet their passion for a strong nation became the catalyst for unity in their working relationship. 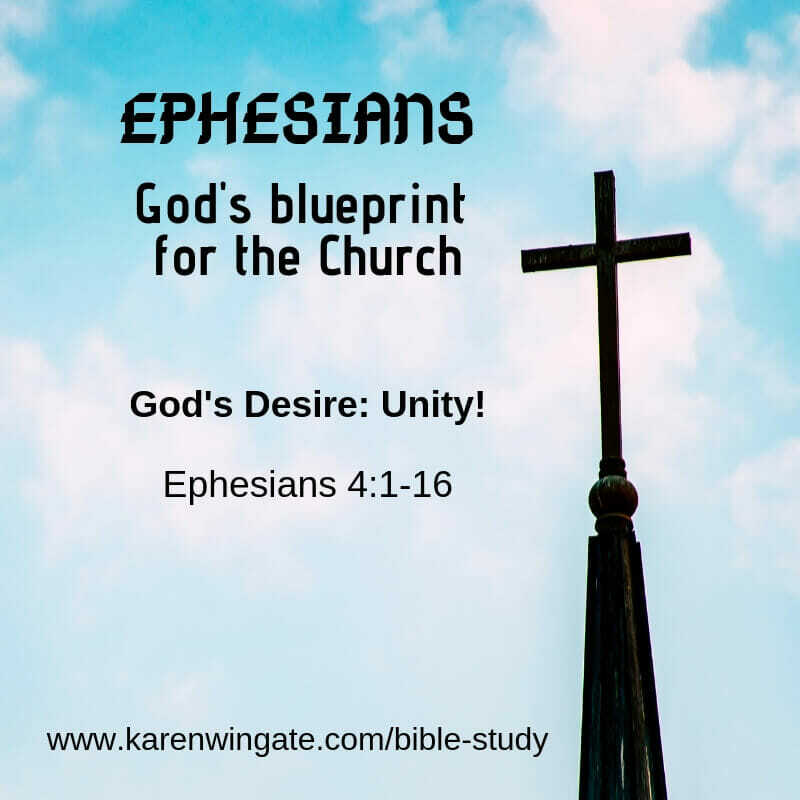 Watch the video that introduces our study of unity from Ephesians 4:1-16 here. The issues surrounding the establishment of a new country became more complex and as more people weighed in with their opinions on how to set up the new government, those positions drove wedges between the friendships of many patriots, including Hamilton and Madison. Sadly, the men’s love of the new nation wasn’t enough to keep them unified. When people have so many opposing opinions, what can possibly hold people together? Is unity possible for the church? Who is the One in charge of the Church (v. 5,6)? How does allegiance to one ultimate leader promote unity in a large group of people? Verse 5 describes this as one faith, one baptism. We can find unity when we all agree on the basic tenets of faith. LIke any membership rules for a group or qualifications for citizenship in a country, there must be one standard for inclusion that remains constant and that both parties agree to. Imagine the chaos in the Church if God had different membership rules or no membership rules at all. Our acceptance of God’s plan of salvation as outlined in the Bible, adheres us to God and to each other. Faith refers to the collection of doctrine found in the pages of the Bible. All Christians are to believe in the saving death of Jesus Christ to abolish the penalty, punishment, and power of sin. We accept this as it is spelled out in the Bible. Baptism, in this passage, I believe, is a word to represent our part in accepting God’s plan. 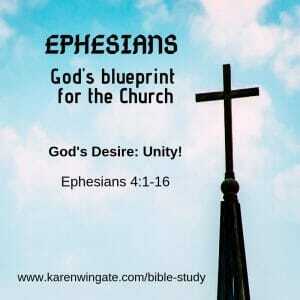 The Bible itemizes how we are to enter in to this unified body of Christ-followers. Agreement with the Bible on how we become part of God’s family unifies us to each other. It is tragic that misunderstanding over what the Bible teaches about our part in the salvation process has caused so much division. What comfort and encouragement do you find in sharing the same belief system with other Christians? We are all so different from each other. Guess what? God intended it that way. Who makes us uniquely gifted? How can a diversity of talents and gifts strengthen the Church? What were some of the gifts needed to launch the new Church in the first century (v. 11)? Now look at Ephesians 4:12,13. Paul explains why a variety of gifts are needed in this new establishment. What was God’s purpose in providing different kinds of leaders (v. 12)? Alexander Hamilton and James Madison were a stronger team because they were different. Hamilton had such a brilliant mind that he was able to cut to the heart of a thorny philosophical truth. Yet Madison had the ability to put those lofty ideas into simple terms. Their diverse gifts made for a strong document that became a classic defense for this brand-new Constitution. God gave gifts to certain leaders to use to prepare others for works of service. Those works of service were to be used to build up the body of Christ. The body of Christ is built up so that all of us can reach unity in the faith. How do you see your church family using their unique gifts to build up the body of Christ? A group cannot reach unity until individual members reach maturity. Maturity means buying into and remaining committed to the tenets of faith, the authority of Christ and the Scriptures, and the leadership of the local church. Why is this strong stable commitment necessary for the Church to have unity? When people have a sound doctrinal core and look to Jesus as their authority, they have less chance of succumbing to two kinds of divisiveness. What are they (see v. 14)? Do you know Christians who are easily swayed by new ideas or deceptive schemes? According to this passage, what is the core problem? How can the Church prevent dissention that is based on uninformed opinions (v. 15)? 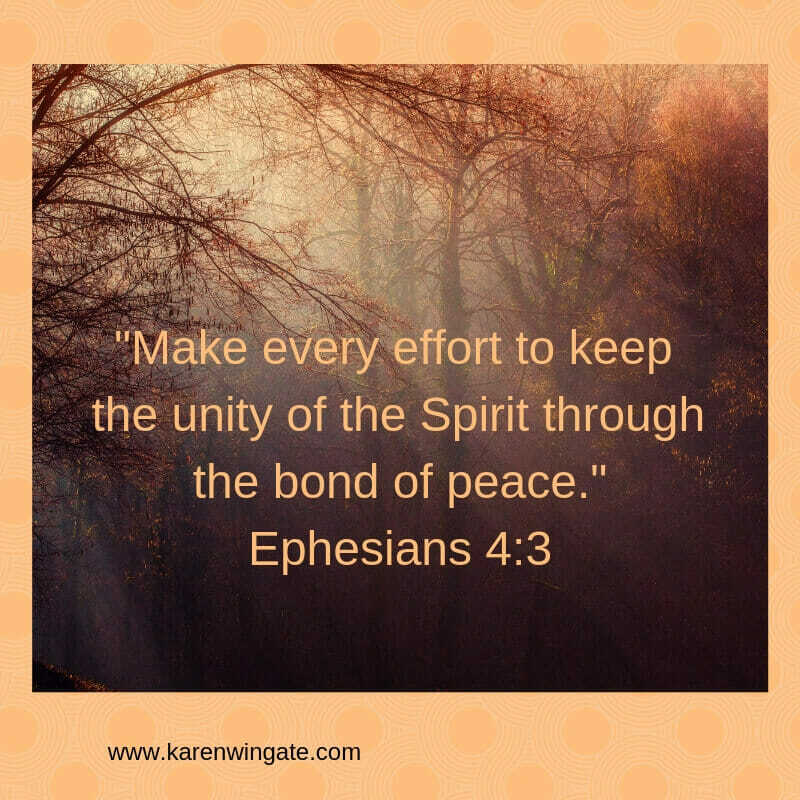 What will help us keep the unity of the Spirit? Where does this love come from? Unity takes work. Lots of work. It doesn’t happen overnight. It’s something we keep reaching toward. So don’t get discourages if you see ways your group is not unified. It doesn’t mean you are a failure. It merely means you aren’t there yet. Go back to v. 1-3. According to these verses, how can individuals promote unity in the church? Go back to v 11-12. According to these verses, and remembering that unity is related to maturity, what can church leaders do to promote unity in the church? It is so easy to look at the divisions and dissensions, bemoaning that the Church is not unified. It’s like looking at a scab on our toe and immediately assuming our entire body is wracked with infection. Yes, it’s possible, but not likely. I encourage you to look at how you ARE unified with other Christians. Celebrate what you share in common. Look for ways you are similar. Praise God for what you do share with other believers. What small step could you take to further the spirit of unity within your local church? What are you doing that you should stop doing? NOTE: I am not an affiliate for anyone. That means, I get no kick-back from any link I post. If I tell about a product or a book, there’s nothing in it for me. I’m merely giving you added Internet resources.